Facebook generated ~$250 million of net income in the fourth quarter of 2010, two sources briefed on Facebook’s finances tell us.Previous reports say Facebook profited $355 million over 2010’s first 9 months. 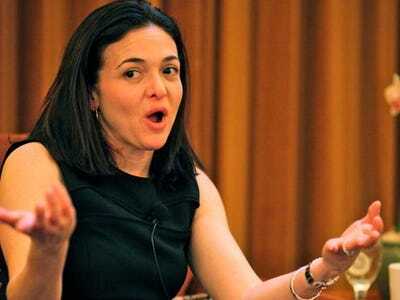 That puts Facebook’s total 2010 profits at $600 million. These sources say the company is on track to generate about $2 billion of EBITDA in 2011 (earnings before interest, taxes, depreciation and amortization). One of these sources says Facebook revenues will surpass $4 billion in 2011. Facebook declined to comment on this story. The projections are just projections, obviously, and Facebook probably isn’t very concerned with generating cash at this point. Even if revenue comes in as expected, Facebook could spend big money on servers, new headquarters, new employees, or even big acquisitions and chew through that cash flow quickly. Facebook makes most of its money off brand advertising, ads that send users to virtual games like CityVille and goup-buying sites, and a 30% tax on Facebook credits. Facebook sold $1.5 billion worth of new stock to Goldman Sachs and its clients in January at a $50 billion valuation. Today, Kara Swisher reported that “big institutional investors” are asking Facebook if they can buy $1 billion worth of stock at $60 billion valuation. The $2 billion EBITDA figure has several investors we spoke to giddy. One remarked that a 25-to-1 PE ratio makes Goldman’s $50 billion valuation of Facebook too cheap to pass up (earnings aren’t the same thing as EBITDA, but who’s counting). And the excitement about the company is obviously warranted: Facebook’s a monster. But for all those who are now convinced that Facebook is “the next Google” (or better), it’s also worth looking at the chart below. 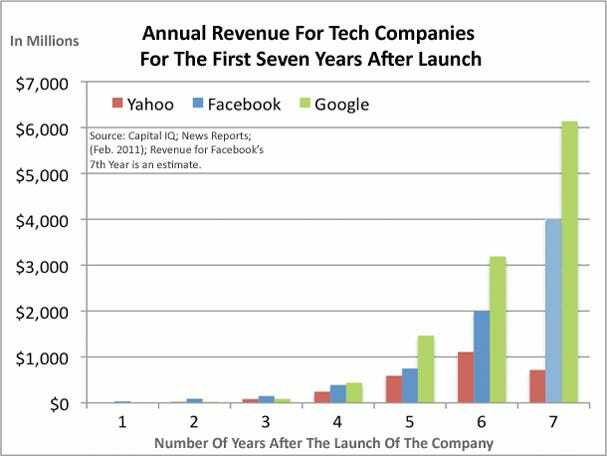 This chart compares the early revenue growth of Yahoo, Facebook, and Google. It shows that while Facebook is growing like crazy, it’s revenues aren’t growing nearly so fast as Google’s did during its first seven years. Related: How Does Facebook Make Money?